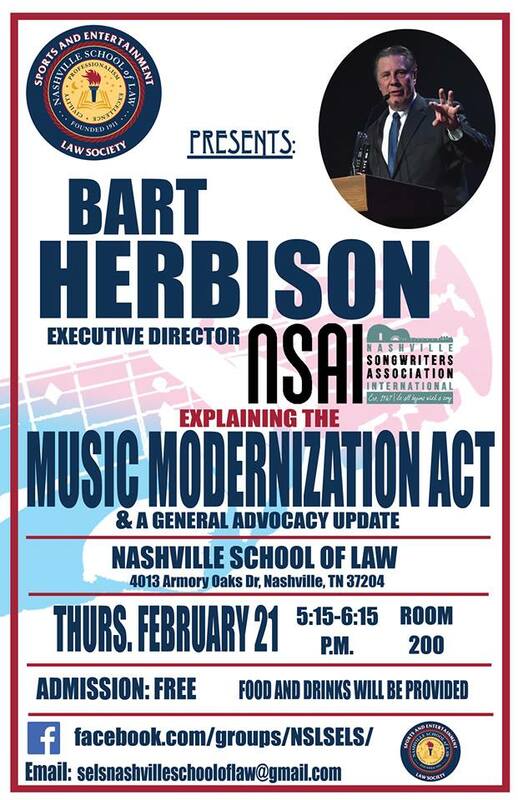 Bart Herbison is the Executive Director of the Nashville Songwriters Association International (NSAI), the world’s largest not-for-profit songwriters trade organization and advocacy group dedicated to the songwriting profession. All attorneys, songwriters, music business professionals, and students may attend for free. A Paris, Tenn., native, Bart Herbison worked as a reporter and spent 14 years in radio and as a correspondent for The Nashville Banner newspaper before joining the administration of former Tennessee Governor Ned McWherter as Deputy Director of Communications in 1987. Herbison joined the staff of U.S. Rep. Bob Clement (D-Nashville) in 1988 where he served as the Tennessee Congressman’s Press Secretary, Campaign Manager and Chief Tennessee Administrative Officer before leaving Capitol Hill for Music Row in 1997. As stated above, Herbison is Executive Director of the Nashville Songwriters Association International (NSAI), the world’s largest not-for-profit songwriters trade organization and advocacy group dedicated to the songwriting profession. Established in 1967, NSAI’s membership of nearly 5,000 spans the United States and many other countries. With more than 100 chapters, the association serves aspiring and professional songwriters in all genres of music. They also own The Bluebird Cafe in Nashville, Tennessee. Under Herbison’s leadership NSAI gained prominence in the national legislative arena. • Passage of the landmark “Songwriters Capital Gains Tax Equity Act” in 2006. • Purchase of the “Music Mill” studios as NSAI headquarters in 2005. In 2018 Herbison received two prestigious national honors for his songwriter advocacy work — the “Industry Legacy Award” from the National Music Publishers Association (NMPA) and the “IP Champion’s Award” from the U.S. Chamber of Commerce Global Innovation Policy Center. Appearing in his first movie role, Herbison portrayed himself in the 2017 film “Wheeler” starring Stephen Dorff. He is also featured in the documentary “The Last Songwriter” released in 2018 and the upcoming documentary “It All Begins With A Song” where he serves as Executive Producer. He hosts the weekly video/print interview series “Story Behind the Song” appearing in The Tennessean and other Gannett newspapers.